Hashing24 is a legit cloud mining service of Bitcoin, the most popular cryptocurrency. The company is operating since 2016, while its project team has been working on the cryptocurrency market since 2012. To date, Hashing24 has offices in the UK, Thailand, and Ukraine. Also, its data centers are located in Georgia and Iceland. Such a wide geography of representative offices helps reduce the possible risks that may arise in connection with the changes in national legislation of these countries. Even the closure of one of the offices in one country will not stop the company activity in mining virtual money for its clients. Hashing24 is an official partner of Bitfury Group, the world-famous company which is one of the leaders in the blockchain technology. It should be noted that Bitfury Group develops and delivers both software and hardware solutions needed to safely move Bitcoins through blockchain. The close cooperation with Bitfury Group indicates the seriousness of this Bitcoin project. Hashing24 puts big funds in the business development and advertisement. Hashing24 positions itself on the cryptocurrency market as a simple and convenient service for individuals willing to invest spare money resources in the process of Bitcoin mining. Bitcoins with large expenses for electricity and maintenance of hardware, it is better to invest in the existing Bitcoin-mining business. First of all, Hashing24 service is for those customers who are interested in reliable investments with an income in Bitcoins and do not search the outsized profits. The Hashing24 cloud-mining service allows everyone to start earning Bitcoins without special knowledge and skills. It is enough to purchase or rent a certain power in Hashing24 and earn the most known and expensive cryptocurrency without undue hardship. You can pay your first and any subsequent contract in one of the ways convenient for you. At your choice, you can pay the contract using your Bitcoin wallet, bank card, OK PAY payment system or bank transfer. You are offered a unique opportunity to start or stop mining at any time. Hashing24 provides customers with an income depending on the ordered power. The cost of the cheapest contract is about $ 20 per 100 GH/S. Note, GH/S is the hash power for obtaining Bitcoins. The more hash power, the more virtual money you will earn per day. The minimum amount for withdrawal is 0.001 BTC without any commission. Therefore, the more you deposit, the more often you will be able to withdraw the earned Bitcoins to your wallet. The Hashing 24 resource provides its customers with an exclusive opportunity to purchase hash power, but this power is not combined into specific packages. It is bought in the amount necessary for the customer. As for the cost, every 100 GH/S costs the user $ 68.5, but the user will have to pay $ 0.00033 as a service charge every day from the profit in Bitcoins. In addition to paying the rent, customers will have to pay a daily fee for maintenance of hardware and for electricity ($ 0.00033). If there is not enough money on the account for daily payment within three days, the contract will be canceled. 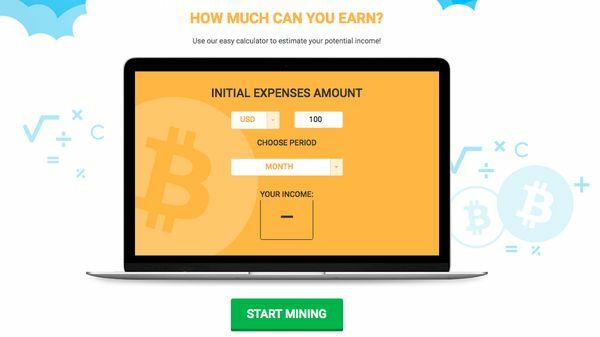 A Demo Mining option is available on the website, with which you can try out different plans and understand the essential points of cloud mining without risking your own money. Unlike other cloud mining services, Hashing24 offers unlimited contracts to invest in. This is a great offer to buying a cryptocurrency. Also, there are no set contracts on Hashing24. The customer selects himself the hashing power and the payment method and, therefore, the profitability of the plan. Let’s consider two sample plans.If you buy a hash power of 2,500 GH/S for $523.73, the daily fee will be $ 0.83. The daily profit is expected to be $ 1.40. The monthly profit after breakeven (374 days) will be $ 42.06. 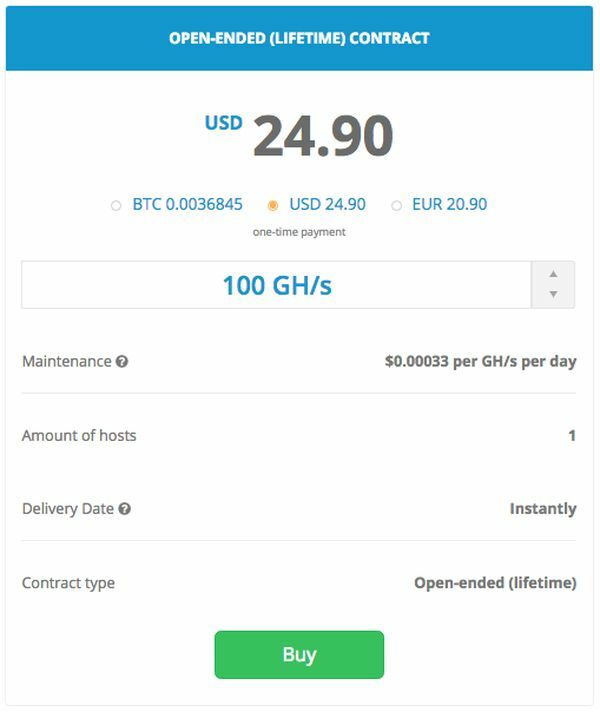 If you purchase 15,000 GH/s for $3,142.35, you will earn the monthly income of $ 252.35 after breakeven (374 days) with the daily fee of $ 4.95. The profitability of investments of Hashing24 is about 150% per annum on average, but it is constantly changing because of the rising complexity of Bitcoin mining. Many cloud-mining services offer almost the same options. However, we can try to evaluate two cloud mining services, Hashing24 and HashFlare. For Hashing24, BitFury is the only hash power supplier. The only supported algorithm is Scrypt. The platform allows every customer to purchase several hash power options at the same time. HashFlare uses HashCoins hardware and supports such algorithms as SHA-256, Scrypt, Ethash, X11, and Equinash. Harshing24 works with Bitcoins only. HashFlare operates with Bitcoin, Litecoin, Zcash, Ethereum, and Dash. Harshing24 offers minimum daily payouts of 0.001 BTC. The maintenance and electricity fees are $ 0.00033 per day. HashFlare makes minimum daily payouts of 0.0014 BTC, 0.0007 ETH, and 0.0004 DASH. The maintenance and electricity fees are as follows: $ 0.0035 per 10 GH/s for SHA-256; $ 0.01 per every 1 MH/s for Scrypt; $ 2.20 per 100 KH/s for Ethereum; and no maintenance fees for both Zcash and Dash. Harshing24 offers lifetime contracts.HashFlare has Zcash, Ethereum, and Dash contracts for one year only and two-lifetime contracts for Scrypt and SHA-256. Both HashFlare and Hashing24 are reliable cloud-mining services. HashFlare offers more cryptos and algorithms to select, but judging by Bitcoins, both services are lucrative enough. The main advantage of Harshing24 is the presence of unlimited contracts and plans. Let’s compare Bitcoin packages offered by Hashing24 and Genesis Mining services. Contracts for purchasing hashing power for mining Bitcoins allow getting an average profit by today’s standards. Each cloud mining service stands for its individual profitability in comparison to one another. The main advantage of Hashing24 relies on the offer of unlimited contracts and more predictable prices for the Bitcoin cryptocurrency. While Genesis Mining offers the profitability of 170% for the maximum package per $ 1,950, it is worth paying attention to Hashing24 contracts with a lower budget for purchases. Then, Genesis Mining promises a maximum profit for Scrypt contracts for a period of 2 years, but all hashing power on Genesis Mining is already sold out at the current moment. However, the Hashing24 conditionally unlimited contracts for mining do not guarantee the permanently high level of profitability for the entire long period. In the event when Bitcoin drops in price or the complexity of mining and the cost of services increase, the actual profit of customers will go down very significantly. It will affect all cloud-mining services. To sum up, the simplicity and the limited number of the offered services at the initial stage does not mean that Hashing 24 will not develop its business further. Now, the company is a good and proven resource that pays without delay, and this is one of the most important characteristics of such services. It can be noted that the Hashing 24 project team did not focus on aggressive marketing to select a longer but more stable approach to promotion cloud mining services.